Could it be possible to skillfully work the full potential of wood or metal without using the best band saw? No. The band saw is an absolute and worthy requisite. A band saw is a saw with a long blade. It consists of a continuous band of metal with saw teeth, stretched between two or more wheels. The blade is more of a ribbon, as it is continually rotating along the wheels. It brings immense value in woodworking, metalworking, and lumbering. It’s proven to be one of the most useful equipment in a workshop. With the wide variety of blades, it has the ability to cut deep sections as well as curved and straight lines. It also has the ability to split, cross-cut, cut slices of thin veneer, angles. curves, rip, even circles. These abilities make the band saw a necessary piece of equipment. The possibilities are many having known the versatility of a band saw. However, it can get quite challenging to choose a band saw that perfectly suits the user’s needs. How to Choose Best Band Saw? 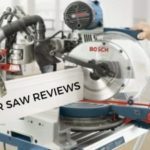 Top 13 Best Band Saw Reviews. Best Cordless Band Saw Reviews. Best Portable Band Saw Reviews. Best Benchtop Band Saw Reviews. Best Stand Mounted Band Saw Reviews. Factor of Concern for the Band Saw. How to use Band Saw? Schedule Maintenance for Band Saw? Common Tools For The Ordinary Maintenance Of A Band Saw..
BenchTop Band Saw Vs Floor Standing Band Saw Vs Floor Model. 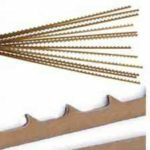 Band Saw Blade & Accessories..
Before actually choosing a band saw it’s advised to examine some important factors. Considering them may help in finding clarity. To know which band saw is most suitable for your needs consider the following elements. The throat capacity is a measurement from the left of the blade to the inside of the frame. It will be slightly less than the size of the wheels. This width of cut that can be completed on a band saw is determined by knowing this distance. So, a 17-inch band saw might have a throat capacity of 16 ½ inches for example. This is probably the more important measurement for you to consider as this one cannot be changed. The depth of cut tells the user how thick of a stock could be cut using the band saw. The measure from the table to the upper blade guides is the cut depth in a band saw. Many band saws that have only a six-inch depth come with an optional riser that increases the depth to twelve. This enables the saw to cut thicker stock, especially when resawing. Based on the cutting demands the horsepower can be determined. A 1-1/2 power motor works typically well for cutting thinner stock with minor resawing. Motors rated at 2 horsepower or larger generally needs a 220V electrical supply. Wood and aluminum are cut about one thousand feet per minute. This is a common speed for a band saw. In aluminum, this speed gives a nice clean cut. With wood, although one can go up to five thousand feet it’s better to be safe and operate at a slower speed. Materials like steel and brass need to be cut at about hundred feet per minute. For brass, you could go a little higher as well. It might appear that the machine is running very slow but this ensures that the blade is not damaged. Proper cutting speed can be determined for plastics based on the type of plastic. There are different varieties of plastics. Looking up manufacturer’s sheet or experimenting can help in determining the right speed. For example, a material such as Nylon can be cut at variable speeds. Acrylic on the other side is brittle in nature and could cause problems at both high and low speeds. Measure the distance from the blade to the throat in order to know the size of a band saw. That estimation is a little more than the largest piece of wood the band saw can manage. The band saw’s large circular blade is placed around the tool’s top and bottom wheels. Some band saws have built-in fences. If the band saw does not have a built-in fence, clamp a piece of scrap wood into position to use as a fence. The essentials for every band saw are having a cast iron or aluminum alloy table. This table tilts up to 45-degrees for angled cuts. The width and length of the table are generally 16 inches and is equipped with a miter track. Consider your budget but not at the cost of quality. Favoring a cheaper alternative may not serve your needs. Concerns like horsepower, build quality for safety are very important aspects. So consider your requirements and band saw the quality and then the budget. Warranty is an obvious consideration when it comes to buying the best band saw or for any equipment. A warranty stands as a promise from the manufacturer about the quality of a product. It is wise to carefully review the warranty from the chosen manufacturer. This ensures that it supports the products long-term use. When correctly set-up the saw ensures safety and optimal performance. Reading the owner’s manual that comes with the unit when setting up the saw is important. This ensures that the band saw performs well. For the band saw to operate properly there could be many fine tuning that could be done. Reading the instructions will also help in becoming familiar with the safety methods mentioned. A battery-powered cordless band saw gives the utmost cutting power and precision. It is convenient to use and is one of the most flexible saws to purchase. DCS371B 20V MAX* Li-Ion Band Saw (Tool Only) has ergonomics and superior balance. This allows for more accurate cuts and less user fatigue. It can cut up to up to 2″ SCH 40 pipe. To increase handle, base, and blade life, it’s designed with a hook. Plus blade tracking adjustment. LED work light allows users to work in dark spaces. The Light with 20-second delay illuminates dark work surfaces for accurate cutting. 2-1/2" cut capacity cuts up to 2" SCH 40 pipe. Centered handle position provides superior balance and ergonomics and allows for more accurate cuts and less user fatigue. Integrated hang hook allows the user to hang the saw without damaging the front handle or base. Tool-free blade changing lever loosens blade tension to allow for blade change. Dual-bearing blade guide rollers provide increased durability in the blade support system. Ergonomic soft grip back handle provides comfort and flexibility. This portable band saw is more lightweight than others in the market. With its centered handle for balance, it's an ideal equipment to work with. The lithium-ion battery implies that you can work for days without recharging. You can take it along with you to site without needing a power source. It cuts with ease through a range of materials including rod, strut, conduit, and pipe. It’s an excellent choice for professional use. The 2 ½ inch cutting capacity gets most jobs done. However, it's still not deep enough as some comparable saws out there. After thorough scrutiny, DCS371B 20V has more benefits than drawbacks. Those who need a dependable tool for regular work can benefit from it. It’s a lightweight machine delivering on toughness. For jobs that need off-site work, DCS371B 20V is an ideal companion. It’s a compact yet powerful tool. It can last through days with the lithium-ion battery installed. 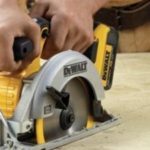 This is certainly another quality product from the DEWALT brand. It’s viewed as one of the best band saw available today. It’s an ideal accompaniment for any serious metalworking workshop. DCS371B 20V gives a excellent value for money. Plus it’s versatile, robust and user-friendly. 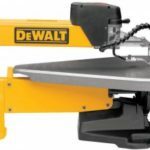 The DEWALT DCS374B 20v Max XR Deep Cut Band Saw cuts curves. It’s a safe and easier saw than it’s equivalents. It best fits for layer-and bundle-cutting. This model is ideal for repeated and heavy-duty jobs as it allows programmable workstations. It has a 5” cut capacity to cut strut, pipe, angle iron, pipe and various other materials. It cuts up to 4″ SCH 40 pipe and double strut. This band saw has an LED Work Light with a 20-second delay. It illuminates dark work surfaces for accurate cutting. It offers a variable speed trigger and the dial allows for versatility and control. 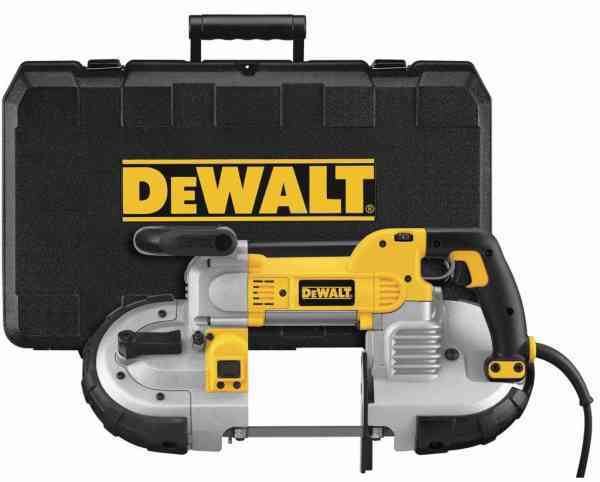 The DEWALT Deep Cut Band Saw is capable of up to 149 cuts of 1-5/8″ Strut with 14 TPI blade. There is an integrated hang hook. This allows the user to hang the saw without damaging the front handle or base. The tool-less blade changing lever loosens blade tension for easy blade changes. This is a bare tool item with battery sold individually. LED Work Light with a 20-second delay. Variable speed trigger and dial allow for versatility and control. It has a LED Work Light that illuminates dark work surfaces for precise cutting. It’s worth every penny that you pay for it. The blade may not last too long. The stock blade didn't last too long. 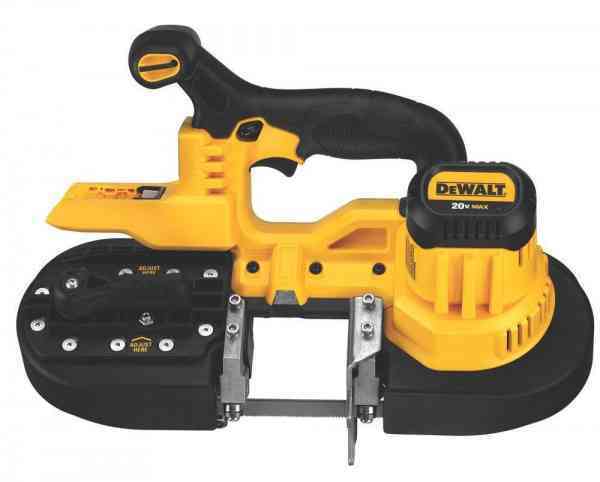 DEWALT DCS374B 20v Max XR Deep Cut Band Saw has many strong features that add value to buyers. It’s smart to read the instruction manual that accompanies the tool. This will ensure setting up the equipment correctly for its optimal use. For the band saw to cut well you may have to fine tune and adjust the tool accordingly. 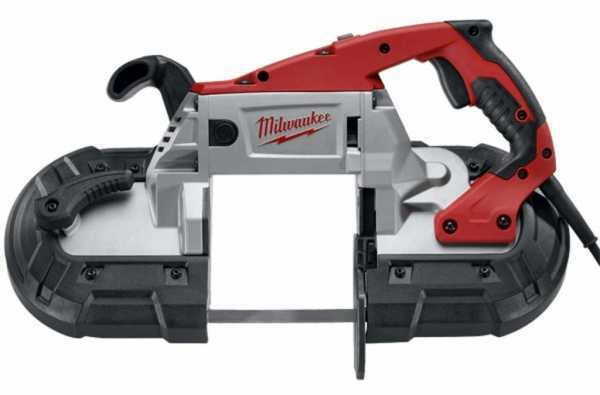 Milwaukee 2429-20 Cordless Sub Compact Band Saw is powered by an electric motor. As well as a battery with the charger that is sold individually. 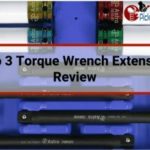 It serves as an ideal tool for cutting support rods as well as conduit. So it’s a tool that provides a lot of flexibility to users. It specifically cuts rebar like butter. This cordless Sub Compact Band Saw is from the collection of Milwaukee Power Band Saws. They are capable of one-handed cuts. The results are so clean that you’d believe the material was cut in a factory. Its 150 cuts per charge, 1⅝ inch cut capacity and 6.6-pound weight are very helpful features. It gives amazing precision and depth normally reserved for table saws. It's a compact size. Plus lightest weight amongst cordless band saws. It easily allows for one-handed cuts. 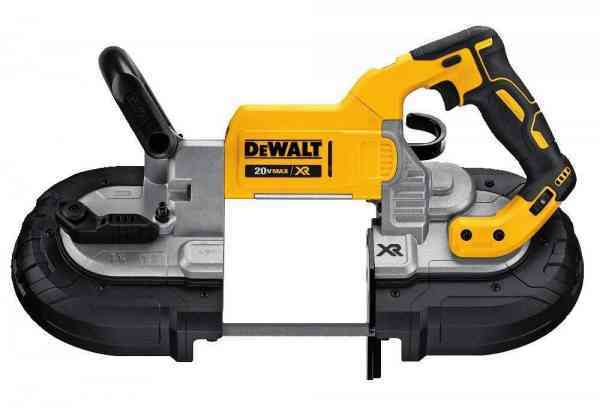 It has powerful motor cuts 3/4-in EMT in 3 seconds, up to 150 cuts per charge with the XC battery. It has a 1-5/8-in Cut Capacity for a wide range of cutting applications. Meets OSHA guarding requirements and is suitable for one-handed use. LED light highlights the cut line, Battery and Charger Sold Separately. One can wield the machine one-handed without losing control of it. It has a cutting capacity of a table saw minus the limited cutting options. It's capable of cutting a ¾-inch EMT in three seconds. It's lightweight and is a compact size. It allows for cutting in tight spaces with depth and precision. There are 150 cuts every charge from the XC battery. The LED light can throw off straight cuts if one doesn't use it carefully. There's an extra cost when buying the battery and charger. Milwaukee 2429-20 Cordless Sub Compact Band Saw is ideal for all the hard-to-reach spaces. Plus hard-to-cut areas filled with pipes, shelves, or other obstacles. Pay close attention to your cuts when using this tool. This is because the LED light to throw off your straight cut. 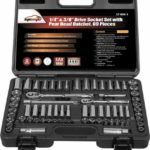 The battery and charger are sold separately because this is a bare tool package rather than a kit. However, it does have your requisite LED light highlights that give you a cut line guide of sorts. It has up to 150 cuts per charge. It’s recommended you buy the charger, battery, and carrying case in case you do not have it. 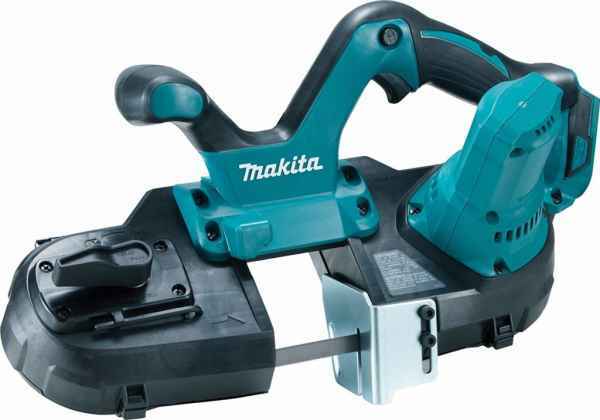 Makita XBP01Z 18V Lithium-Ion Cordless Compact Band Saw is a bare tool style product. Here’s an overview of their key offerings. The XBP01 is superiorly engineered to meet the demands of the user with up to 27% less weight. This gives a huge advantage when cutting in-place/overhead. 6745-2-20. Makita is the only manufacturer that offers this with the preferred 18V platform. Part of the World’s Largest 18V Lithium-Ion Platform 70 + and expanding. Compact design at 18-1/2" long; weighs only 7.5 lbs. 2-1/2" cutting capacity is ideal for cutting conduit, Unistrut®, copper pipe, threaded rod, angle iron and channel. 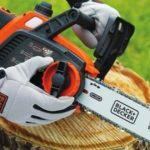 Includes a blade wheel cover that covers the blade outside the cutting area making the saw suitable for appropriate one-handed operation. Built-in L.E.D. light illuminates the work area. Protective bumper design for added durability. "Tool-less" blade system for fast blade installation and removal. Adjustable foot protects material and provides improved support for accurate cutting. Soft grip handle provides increased operator comfort. Tool hook secures the tool when not in use. Tool Only, battery and charger not included. Compact Design at 18-1/2" long' Weighs only 7.5 lbs. 2-1/2" Cutting Capacity is Ideal for Cutting Conduit, Unis rut, Copper Pipe, Threaded Rod, Angle Iron and Channel. Makita-Built Motor Delivers 630 ft./min Blade Speed for Fast Cutting. Built-In L.E.D Light Illuminates the Work Area. This lightweight tool can be used and carried anywhere. Soft handle grip gives much better command over the saw. Blades don’t stay on and might cause some trivial issues. Its bare tool style product. serves as a valuable band saw. It comes with some great and amazing features. It makes as one of the best band saw that’s available today. Many users have found certain problems with this product. The blades slipped and didn’t stay on. This turned out to be a failure when sawing. But, many found that if you take off the wheel connected to the tension lever, there is a small hex screw. This screw when tightened solves the problem. 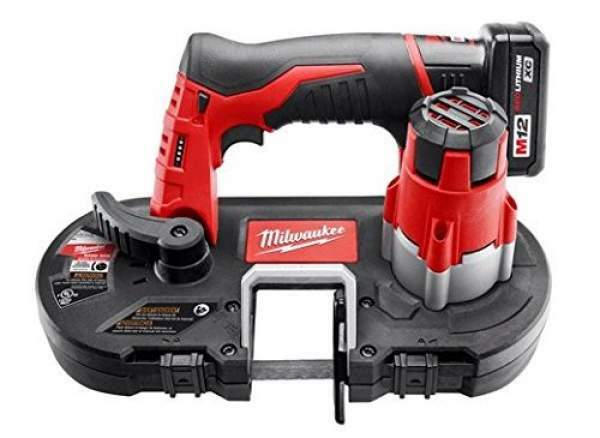 Milwaukee 2429-21XC M12 Cordless Sub-Compact Bandsaw Kit is one of the most compact and lightweight models around. It’s one of the easiest to use on the market. It’s a basic bandsaw that features high-quality parts and works as advertised. Overall M12 Bandsaw Kit is simple to use and easy to handle. The Product is highly durable and is made In China. 18 TPI Sub-Compact Band Saw Blade. 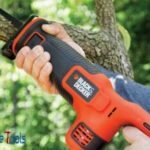 Powerful Motor: Cuts 3/4" EMT in 3 seconds, up to 150 cuts per charge with the XC battery; Blade Length: 27” x ½” x.020"
Meets OSHA Guarding Requirements: Suitable for One-Handed use; Length: 11 "
The Design is decent. Its lightweight and ergonomic design help in utilizing the unit with only one hand. The hand grip could have been designed better. Some people found it thick and not ideal for small hands. The 1-5/8-inch cutting capacity is decent enough. The 12V battery is quite good and it will yield around 150 cuts until it needs a full recharge. The number of cuts is only an approximate guess. It solely depends on what materials you are cutting and how thick they are. The battery is good. It is not heavy or cumbersome and it doesn’t take much time for a full recharge cycle. Therefore, there is less downtime. One feature that stands out is the LED light. It helps if you’re working in a dim and dark environment. On top of that, it illuminates the cut allowing you to pay attention to the accuracy of your cut. The ability to use the machine right out of the box is a vast advantage. Most units don’t include the battery, charging station, or even spare blades. However, this one comes with all of these. This means you can save money this way. However, it’s advised to get a couple of spare blades. The ones that are included aren’t as high-quality as one would expect. The hard case is also of value. The addition certainly is a respected based on its affordable cost. The plastic shroud design could’ve been different. Metal parts are surely more durable and can withstand hits, bump, and other frequent mishaps better. Milwaukee 2429-21XC is best for occasional users. It’s affordable, compact and efficient. It’s worth investing in this particular model. If you’re looking for a mid-range unit with a couple of useful features, this one might be a good solution. Portable band saws are due to the way the saw blade moves. They offer vastly diverse uses than what you’d get with a conventional band saw. These band saws are about the size of a handheld circular saw and offer a very small cutting area. Portable band saws are mostly used on job sites. It’s often used for trimming unnecessary pieces off. This is useful for plumbers, who may need a handheld band saw when trimming pipe pieces. Contractors can use these saws for trimming workpieces that involve metal or plastic. Milwaukee 6238-20 AC/DC Deep Cut Portable Two-Speed Band Saw provides in-class power at 11 Amps. It has advanced cut visibility and the industry’s largest cutting capacity. It delivers unparalleled durability and performance without reducing portability. It delivers long-term reliability and performance. This makes Milwaukee band saws the standard in industrial metalworking. The all metal direct drive system gives game-changing durability. It delivers the maximum tool life possible. Plus it requires less servicing than a chain drive. Its balanced body design allows the tool to rest comfortably in the user’s hands. The lighter 14.5-Pound build provides more control over the tool with less fatigue. Additionally, the gear protecting clutch extends gear and motor life. This occurs by absorbing high impact forces caused by blade lock-ups. The new debris protection system delivers longer pulley life. This results in removing dust and debris during tool use. The 6238-20 Deep Cut 2-Speed Band Saw comes designed with a slimmer motor housing. This helps to increase the user’s line of sight. It also delivering superior cutting accuracy and revolutionary cutting visibility. Helps to get precise cuts regardless of the material you need to work with. It has the ability to make precise cuts. Built-in LED system that provides proper illumination in any work situation. Durable, sturdy and rugged, the 6238-20 is designed for the long haul. Milwaukee 6238-20 is an easy choice. The manufacturer delivers a tool that can really help improve the cut precision. It’s ideal for large projects that require sheer power. The DWM120K is long-lasting and versatile. It’s Deep-Cut Portable Band Saw Kit features a powerful 10 amp motor. It also comes with changeable speed control for material-specific and application-specific cutting production. It offers an LED sight. This indicates the cut line ergonomic grip options and an integrated hanging hook. Deep Cut Portable Band Saw Kit provides 10 amp. Its motor handles tough applications. Variable speed control from 100 to 350 sfm brings in versatility. It has 5-inch deep-cut round-stock capacity; 5 by 4-3/4-inch rectangular-stock capacity. The LED sight light makes cut line easy to see. Ergonomic handle design improves control. It includes a hex wrench, standard blade, and kit box. It has a three-year limited warranty, one-year free service, 90-day money back guarantee. This kit features a portable band saw with a 10 amp motor and a sturdy kit box for safe keeping. Industry best 10 amp motor designed with controlled power to withstand any job site application. Serviceable steel shroud and rubber bumpers allow guards to withstand job site abuse without damage. Devised to take on the toughest wood materials. Can perform quick and easy cuts. Can do rectangular or circular cuts that are five inches deep. You get a three-year warranty when you purchase the product. It has a durable construction that makes it more capable for heavy duty projects. The case does not hold the machine very well. The cost is comparatively high to other heavy-duty cutting tools. The DWM120K DEWALT model is highly recommended. This band saw offers stability and accuracy to the users. The 10 Amp motor can saw steel, aluminum, copper, bronze, and wood. It is carefully designed and well built. It covers a wide range of site tasks while providing the user ease and comfort. It also has a long blade life. Benchtop band saws can be every bit as robust and versatile as floor standing models. Benchtop band saws are more mobile versions of floor standing models. As with other benchtop saws, these band saws are meant to be attached to a solid flat surface. This functions as the saw’s stand and base. Benchtop band saws are the most popular for the average DIY woodcutter. It does not take up as much space and has the advantage of being more mobile. Some benchtop band saws vary in their sizes, being nearly as small as a handheld band saw. Either way, if it can be clamped to a workbench or flat surface, it’s a benchtop band saw. The WEN 9-inch Benchtop band saw attacks boards with cuts up to 3-5/8 inches deep and 9 inches wide. The 2.8-Amp motor rotates the included 3/8-inch blade at up to 2460 feet per minute. 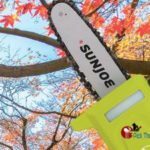 The design of this saw uses 62-inch blades anywhere from 1/8 to 3/8 inches in width for both intricate yet powerful cuts. The spacious work table measures in at 12 x 12 inches in size and can be leveled up to 45 degrees. This set includes a handy carrying handle, a Miter gauge and an onboard dust port. Plus a fence for forming straight cuts, and an adaptable blade guard. Ball-bearings give the blade smooth operation and a long lasting life for years. 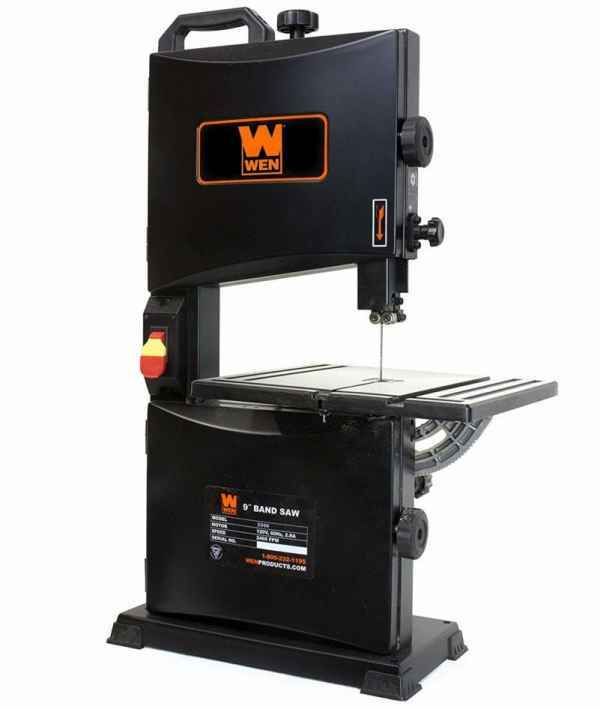 WEN 9-inch Benchtop band saw comes backed by a two-year warranty. It’s a nationwide network of skilled service technicians. They also have a friendly and helpful customer phone line. It creates cuts up to 3-5/8 inches deep and 9 inches wide. It uses 62-inch blades anywhere from 1/8 to 3/8 inches in size. Spacious 12 x 12-inch worktable bevels up to 45 degrees. Includes a 3/8-inch-wide blade, a dust port, a fence, a miter gauge and a 2-year warranty. 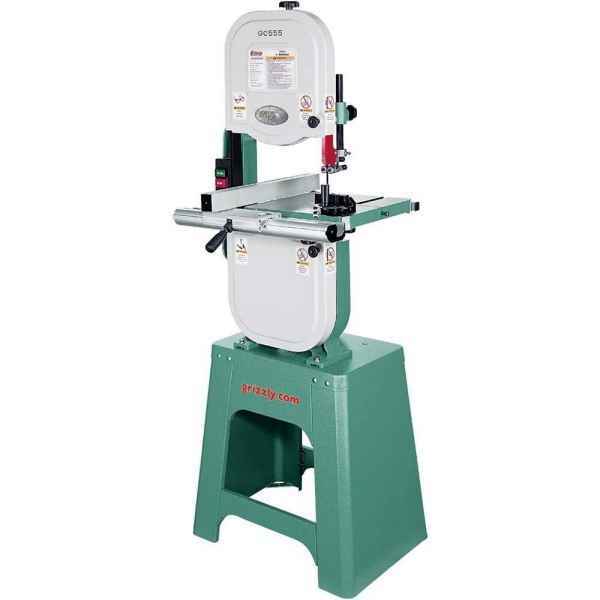 Overall, WEN 3939 2.8-Amp 9″ Benchtop Band Saw is a good option. WEN’s effort in providing a nationwide network of professionals is appreciated. Plus it’s always good to have a helpful and prompt customer service phone line at hand. The SKIL 3386-01 2.5-Amp 9-Inch Band Saw – Power Band Saws is a good saw for home repair and hobbyists. This versatile band saw is cleverly designed with an attached flexible lamp for increased visibility and a miter gauge. The table top is a full 11-13/16-inch square and the cutting depth is 3-1/8-inch with a throat depth of 9-inches. It comes with a flexible work light, blade, parallel guide, miter gauge, and hex key. Compared to stronger table saws, it gives a good midway option to scroll saws that aren’t powerful enough to deal with larger pieces of horn or timber. Also, table saws that overpower smaller wood or horn slices to the point of turning them into sawdust. The SKIL 3386-01 comes intact with a one-speed motor that’s strong and speedy enough to cut through metal, plastic, and wood materials. This versatile band saw is intelligently designed with an attached flexible lamp for increased visibility and a miter gauge. Plus a rack and pinion table adjustment option to allow for height and angle adjustments. Rip fence for straight, accurate cuts. 6-TPI band saw blade cuts through a variety of wood materials. Articulating LED work light for a better view of workpiece and cut-line. Rack and pinion table adjustment for quick angle and height adjustments. The motor is 1-speed for wood or metal-based materials. Quick height and angle adjustments with rack and pinion table. Its cuts and straight and accurate thanks to its rip fence. The 1½ dust port ensures that the work area is clear of dust every time. The cost is amazingly low for a quality stationary power band saw. Too light and flimsy for a stationary saw. Some units don't come with a rip fence as advertised. 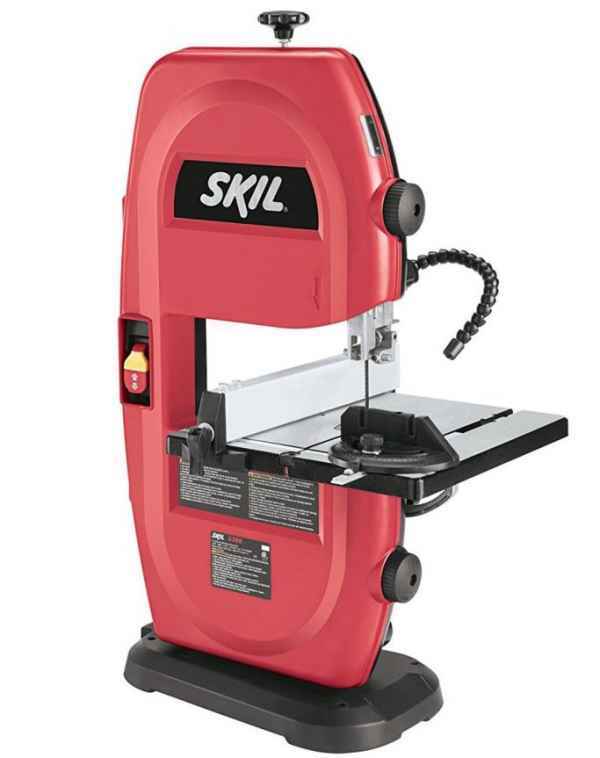 The SKIL 3386-01 2.5-Amp 9-Inch Band Saw particularly excels as a band saw with a weighty stand. It might not have the highest cut capacity or weight. But it has a nice balance of the three. Plus it has various extras like a non-obtrusive LED work light and a dependable rip fence. 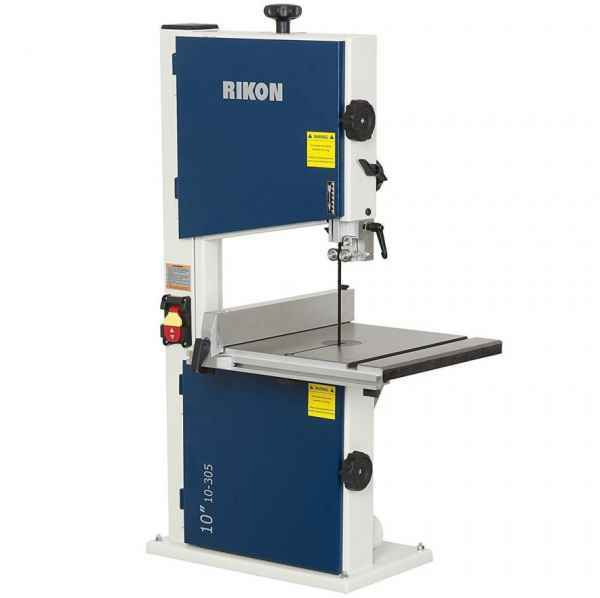 Rikon 10-305 Bandsaw With Fence, 10-Inch is a bench top model. 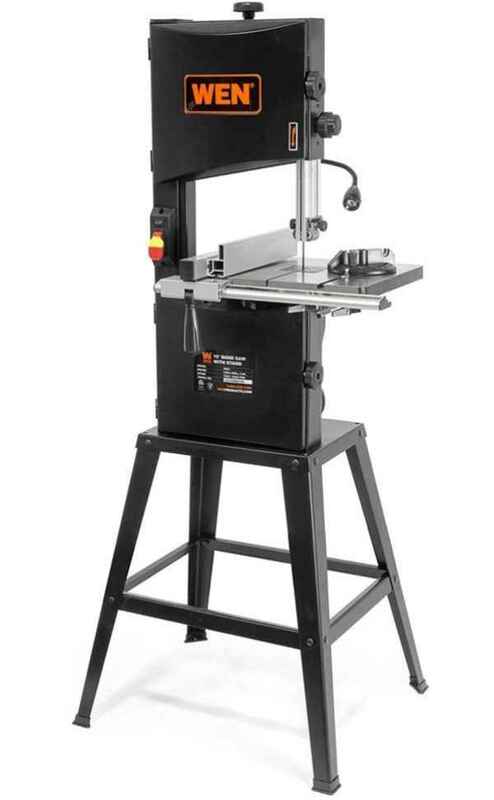 It offers all the features of a full-size band saw. The large cast iron table, edge facing thrust bearings and a powerful 1/3 HP induction motor. Plus it’s 4-5/8 in cutting capacity. 1/3 HP, 3.5 amp motor, speed 2780 ft/min, safety paddle switch. Height 4-5/8”, Width 9-5/8”. Table is 13-3/4″ x 12-1/2″. Edge facing thrust bearings. 70-1/2″ blade range from 1/8″ to 1/2″. 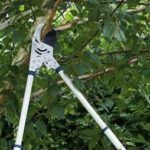 Includes accessories - micro adjustable guide post along with a handy fence measuring 13 1/2” x 1” x 2”. It also comes with a general purpose blade sporting six teeth per inch in a regular pattern with a width of 5/16”. No miter gauge, only the fence. Rikon 10-305 lacks when it comes to horsepower and “flagship” features. Though it comes through in other ways. Built as a machine “capable of doing pen blanks,” the Rikon 10-305 is capable of much more. The depth of cut is good enough to let you get through medium-sized or thicker stock. Plus curves are no problem for this bandsaw. This machine is a great buy for woodworkers given the price and its capacity. It could be a tool to getting started or for hobbyists. It would also be a handy tool if you love doing DIY projects. Large floor standing saws are used by the majority of professionals. 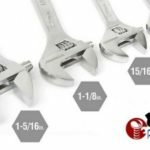 These models are very powerful and are capable of significant cutting sizes. They take up a right amount of space and are capable of significant cutting sizes. These band saws are also the most expensive. It has a larger workspace, table size, and positioning. This makes intricate cutting and ripping large piece much easier. Grizzly G0555 The Ultimate Bandsaw, 14-Inch comes at an affordable price point. This quality band saw is geared towards professionals that need a larger machine. It’s powerful enough to handle cross-cuts, curves or even veneers with the right blade. Bandsaws this size usually aren’t fragile, and that’s the case with the Grizzly G0555. It has a robust frame made of cast iron which partially adds to the weight. The cast iron table is precision ground and adds to the heft as well. It has a sturdy, stable surface to sit on. It’s made from durable heavy gauge steel with an open design. It is proficient in wood, metal and various other materials as long as you have the right blade. Setting up the saw is relatively easy as well. This bandsaw is somewhat quieter than other 14” machines, which is a major plus if one uses it at home. Saves time because of the quick-release blade tension. Dust port helps to keep work area clean. Comes with a fence along with a miter gauge. Also comes with a 3/8” blade. The 4” dust collection port is mediocre compared to other models. The positives far outweigh the negatives on this model. This bandsaw is a fine option for hobbyists that want to try their hand at woodworking. It will give something stronger than a tabletop model. It is also good for consumers that do remodeling or DIY projects. As for the professionals, it’s a mixed bag. It comes down to the size of stock you need to cut and resaw capacity in some cases. Product 2: WEN 3962 Two-Speed Band Saw with Stand and Worklight, 10"
two-speed motor that can create cuts that are 9¾ inches wide and 6 inches deep. Aside from the impressive cut capacity, the motor also runs on 120 volts of power. is to get a variety of both intricate and powerful cuts. The spacious work table measures in at 14 x 12-1/2 inches in size and can be swiveled up to 45 degrees. This package includes a flexible work light to illuminate the worktable. It also has aa 3-in-1 dust port to fit a variety of dust extractor hoses (1-3/4, 2-3/4, 4 inches). Also a fence for creating straight cuts, and a miter gauge for angled cuts. workbench. It comes with a two-year warranty and a network of skilled service technicians. They also have a customer phone line. It's available for sale in three variants: 9 inches, 10 inches, and 14 inches. You're ensured of the cleanest cuts due to the unit's cut capacity of 6 inches deep and 9¾ inches wide. The unit makes use of any 72-inch that's anywhere between ⅛ to ½ inches size. The work table is spacious and offers 45-degrees of the bevel up angle changes. It goes from 1,520 FPM to 2,620 FPM allowing you a larger range of materials to cut. It includes a work light, the 3-in-1 dust port, miter gauge, and fence. Adjusting its settings can get quite a challenge. The 9-inch and 10-inch units are flimsy compared to the 14-inch unit that's worth a whopping $500. WEN 3962 Two-Speed Band Saw is significant enough to outdo just about every portable band saw. The 10-inch version is worth its cost. 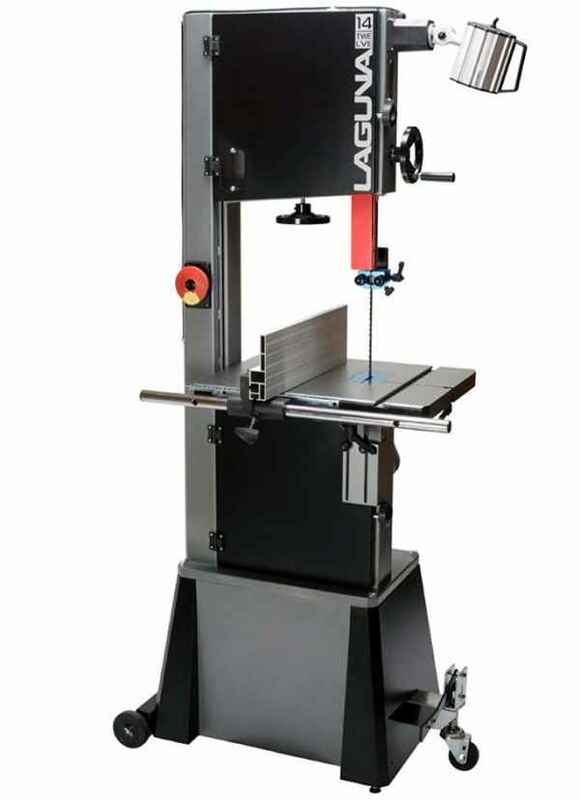 The Laguna Tools MBAND1412-175 14 x 12 Bandsaw is in its own league. It comes with a 13/4 HP motor which helps in delivering most power in best voltage volume of 115 Volts. It’a received CSA certification indicating it’s high quality. There is an illuminated switch with a safety key as well. It has a steel frame construction. This means it is highly durable and will last for a good period of time. The table is micro-polished which makes it a neat and tidy one for use. The resaw capacity is 12 inches. It comes with a 14 x 12 Bandsaw with a 4-inch dust port. Precision tension scales makes all your cutting easier and much more accurate. Resaw Capacity: 12", Throat Capacity: 13 5/8" , Blade Length: 115", , Aluminum Rip Fence: 18" X 5 1/2" X 1/2"
There is no major flaw in the Laguna Tools MBAND1412-175 14 x 12 Bandsaw. It well designed and has good performance. It is cheaper than other band saws available in the market. There are two most common styles of frames that are currently available. One is steel frames. Which is European in style and the other is cast-iron frames. The cast-iron frame bandsaws have been around for generations. Traditionally they are available in a 14″ platform. They consist of two large machined castings, upper and lower assemblies. These saws are perfect for everyday bandsaw operations. However, the motor size and cutting capacities can limit the operations. The height capacity can usually be expanded with a ‘riser block,’. But these machines typically have a motor rated between 1 and 1-1/2 horsepower. This is underpowered for larger resawing applications. The steel frame bandsaws have been popular in the European market for some time. They have recently made a big splash in the US market. These saws have one-piece frames made from heavy, welded sheet steel. The popularity of this design is due to the construction method. This enables manufacturers to increase cutting capacities without sacrificing deflection and strength. These saws are available in multiple sizes ranging from 12″ up to 24″. The band wheels are the means by which the power of the motor is transmitted to the blade. Wheels should be well balanced to minimize vibration and for accurate blade tracking. a good quality tire needs to be fitted. Smaller or Hobby rated machines usually have cast alloy wheels balanced by hand. Larger capacity Trade or Industrial bandsaws have dynamically balanced alloy iron or cast wheels. These are made using advanced industrial machinery. The ‘flywheel effect’ offered by cast iron wheels enhances cutting performance. Plus damping out vibration. They are also better able to withstand the tensioning forces of larger blades. This is undoubtedly one of the most important aspects of any bandsaw. The saw won’t be able to produce straight and uniform cuts if the blade isn’t tensioned properly. It is the spring that tightens the blade. A tensile force of up to 20,000 psi can be applied to the blade when it’s tensioned. This can go up to 30,000 psi if using a bi-metal blade as they are much stronger than ‘stock’ blades. The frame of the machine must be sufficiently strong. This way it can resist this force and not distort under pressure. Bevel capacity indicates the maximum bevel cut the saw can make. The bevel adjustment is located towards the front of the saw, and a little off to the side. It is responsible for adjusting the bevel angle when cutting. This allows the user to make angles in the object with ease. This is often down with a knob attached to the plate. Work lights are an essential aspect to everyone who works around the shop. It Illuminates all workpieces is integral. Work Light as a stationary power tool comes in a variety of styles. Based on the user’s specific needs there are a variety of options available to buy from the market. The blades for band saws come in a variety of sizes and types. It depends on what they are to be used for. Each blade is identified by the number of points (teeth) per inch, the gauge (thickness) of the blade, and its width. The majority of blades are going to be within an eighth of an inch and a half inch wide. Although larger band saws will have larger blades. The exact spacing, shape, and arrangement of the teeth are dependent on the use. As a generic rule, the narrower the blade, the tighter the curve it will cut. With other saw blades, smaller teeth are better for cutting metal. Fewer and larger teeth are used for cutting wood. Dust collection is significant both from a health perspective and a productivity aspect. There are many easy ways to better control the fine dust produced from the band saw. Many users come up with innovative ways to solve this problem. Before recent developments in bandsaw design, dust control wasn’t always a straightforward proposition. However now most newer bandsaws have built-in dust ports now. Our Recommendation for Choosing the Best Band Saw. We’ve covered quite a lot in this thorough guide. 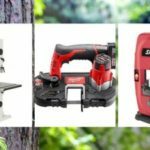 From cordless, portable, benchtop and stand mounted band saws. Each one is unique and has a different value. It’s your individual requirement that will determine which saw is the best band saw. Today there are so many options on the market. It can get overwhelming and confusing when making a buying decision. We recommend identifying your need first. Think about your specific requirements and the nature of your work. Based on this you can find the best band saw. This information is for your reference. So we suggest you go through this guide. So it can assist you in making the right decision. Also look at the topics and questions discussed below. They deal with some fundamentals of a band saw to help clarify and learn more. The band saw is one of the most essential tools if you plan on doing complex cuts. A band saw has the capacity to make any kind of irregular cut. Band saws are mainly used in woodworking. But they are also very useful in metalworking and lumbering. The saw’s advantage includes uniform cutting action from a distributed tooth load. It also has the ability to cut irregular or curved shapes like you can work with a jigsaw, in a more controlled way. All band saws utilize the same general idea and operation. However, there is some variance among the different types, their respective capabilities, and uses. Band saws for metal cutting are rarely any different from other types. The main difference resides with the actual blades being used. Designed blades for metal allow the band saw to handle the materials better. It decreases waste and allows better control. Band saws are made for wood cutting by default, and that includes the type of blade. There are many different blades available for various types of wood cutting needs. How frequently will you be using the saw? This question takes us back to our specific needs that are to be performed and fulfilled. Also deliberate on what type of material you would be cutting. Each band saw comes with it’s unique capabilities. Knowing the type of material you will be working with will help in finding clarity. Owning a band saw in your shop adds a lot of different cutting capacities to your arsenal. The band saw can add curved cuts as well as resawing and even safer ripping than you can do on a table saw. A band saw is just what it sounds like. It’s a big, looping saw blade that’s passing along these two wheels. And so, it’s spinning around. The blade is working down into the table. All the cutting half is down onto the table. This makes it very safe. There’s no chance of kickback as there is on a table saw. There are a couple of settings you need to have set up before you can use your band saw. For instance, you have to have proper tension on the blade. You also have to set these guide bearings so that they control the lateral and side to side. Plus lateral and backward movement of the blade. So, once those are set up, and that’s different on every machine, then you’re ready to saw. One of the main things you do have to change before you make any cut, though, is the height of the blade guard. So, the blade guard can move up and down and it covers or exposes, a length of the blade. Depending on how thick of a piece of wood you’re cutting. There a number of cuts you can make on the band saw. Ranging from curved cuts to resawing, which is basically tall ripping of wood. And, in order to do those various types of cuts, you have to decide, beforehand. If you’re doing a curved cut of any kind, you’re going to want to figure out the maximum radius that it has. Plus find the right blade. Essentially, the thinner the blade that you put on, the narrower the blade, the tighter the radius that you can do. For general cutting keep, half inch blade on the band saw all the time. Just for doing the general ripping and crosscutting and some light, curved pieces. That works just fine. Take every care when using a bandsaw for your projects. Even though the band saw is generally regarded as among the safest of all tools it is still a critical machine. It can produce significant damage if used improperly. Keep in mind the following points when using your band saw. Learn about the tool you are using to diminish the risk of injury and to help you get the most out of your band saw. Band saw blades pivot at considerable speed. Small pieces of stock can be driven in nearly any direction. If a blade breaks, the probability exists that a piece could come loose. Your eyesight is too valuable. So wear protective eyewear. Cultivate the habit of using your safety glasses at all times. Wear ear plugs or ear muffs when using your band saw if that makes you feel more secure. Also, wear suitable attire for working with your band saw. Avoid loose-fitting clothing particularly long-sleeved shirts. This could get caught in your work or in the band saw blade. Check Your Band Saw Before Every Cut. During the cut, your band saw uses a large number of blocks and wheels. This is to keep the blade in its proper position. These blocks and wheels should be regularly inspected for wear. Adjust as per your manufacturer’s instructions. Failure to adjust these blocks and wheels will cause undue wear and tear on the blade. It could cause the blade to break early. Check that the tension on the blade is set to within the limits outlined in your band saw’s owner’s manual. Once your band saw is set well. Once it’s tightened to the correct tension level for the blade you’re using, you should prepare the saw. For it to make a cut on your stock. With the motor turned off, place the stock to be cut flat on the band saw’s table. Lower the blade guards to within 1/8″ to 1/4″ of the stock. Leaving the blade guards too high will place excessive tension on the blade. It will increase the probability that you’ll break the blade. Keeping the blade guard in this range from the stock will also increase the accuracy of your cut. “free-hand” the stock in mid-air. The stock must remain flat on the surface of the table at all times during the cut. If a particular, consistent-width rip or precise angle is to be cut, use a band saw rip fence or miter gauge to assist with the cut. Not only will this increase the accuracy of the cut, but it will make the cut safer as well. When cutting curves, draw the outline of your projected cut cleanly on the stock. Then, keeping the wood flat against the table, ease the stock through the saw along the outer edge of the cut line. It is almost always better to leave a slight bit of stock outside the line that can be cleaned up with a spindle sander after completion of the cut, as your band saw blade will likely leave cut marks that need to be sanded smooth. Cutting directly against the cut line will not leave room for sanding. When cutting curves, always move slowly and methodically. If you must back out of your cut, hold the stock firmly in place with one hand and turn the motor off with the other. Do not try to back the stock out of the cut until the blade has come to a complete stop. When cutting tight curves, go slowly and use “relief cuts” anywhere possible. These are cuts that cut through scrap portions of your cut out. It gives you a better angle on accessing a section of your outline. It is safer to make a lot of relief cuts and cut a tight curve in short sections than to try and make one long, inaccurate cut. At no time through any of your cuts should your hands be any closer than about three inches from the blade. One hand should be on each side of the stock, easing it through the blade. You should never place your hand directly in the cut line, even if it is more than three inches away. If you must hold the stock closer than three inches, do so only with a push stick. You should also never reach across the band saw. If the on/off switch is on your left, use your left hand to turn it on and off. When working with your band saw or scroll saw, there will often be very small pieces of stock that are cut off of your big piece of wood. Do not try to flick these away from the blade with your fingers. Use a different piece of stock or a push stick, preferably with the blade stopped. Usually, this is not required, as the next cut will push the piece safely away from the blade. Once it is clear, push it off of the table. Never leave loose pieces on your table that could impede your cut. When working with woodworking machinery, do everything you can to avoid disturbances. If someone tries to interrupt you while making a cut, do not avert your eyes from the tool. Finish the cut or safely turn off the saw before diverting your attention. Too often, injuries occur because the operator was distracted, even for only a moment. Establish a rule with those around you who might be inclined to interrupt. If they need to disturb you when working with your machinery, ask them to wait until the cut is finished. Schedule Maintenance of Band Saw? Maximizing the life of the machine and blade by giving your time to maintain it well. You could plan a daily, weekly and a monthly schedule to ensure your band saw is in optimum condition. It takes no more than 30 to 60 minutes to do all the necessary checks and maintenance on a band saw. This preventive care every day takes a little time investment. It will save you a lot of money. Plus it will ensure a long lifespan for your machine and blade. It’s advised to have a maintenance schedule. The schedule could outline the steps that need to be taken and should be located near each band saw. This will help in reminding operators to keep the machine in optimal condition. It will also serve as a record of the date each maintenance function was completed. To do precise and detailed preventive maintenance, you must know the machine’s specific checkpoints. Refer to the band saw’s manual to ensure that no area needing regular maintenance has been overlooked. Clear chips from vise jaws, band wheels, blade guides and wipers, chip brush and pans, and machine surfaces. Examine the blade, blade wipers, blade guides, and chip brush for wear. Replace worn parts. Check to saw fluid and lubricants. Check the maximum and minimum speed range using a tachometer. The reading should be the same as the gauge. 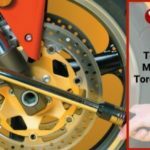 Improper speed can cause numerous blade problems. If the speed is incorrect, ask the machine manufacturer for the proper technique for calibrating the speed gauge. Clean sawing fluid/lubricant reservoir and screen. Clean hydraulic fluid reservoir magnetic plug. Lubricate saw column pivot point. Examine and adjust blade guides. Drain hydraulic fluid tank and change fluid. Clean hydraulic fluid strainer and fluid filter. Change transmission oil. Common Tools for The Ordinary Maintenance of A Band Saw. Taking care of a band saw is just as important as using it correctly. 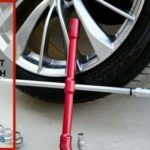 These are the common tools that usually accompany ordinary maintenance. When you’re making a choice on what kind of bandsaw to purchase, size is going to matter a lot. Any band saw will have limits as to the size of the material. You’ll be able to have it cut and in almost every case the floor standing models will be able to handle more. The two things to consider here are the throat capacity and height capacity. Another important difference in a benchtop or floor standing band saw is the power. The larger band saws have larger motors. They are more robust which means they are capable of more. They will cut harder, denser, and thicker materials much more easily. This isn’t to say that the bench top saws aren’t competent of a wide range of work. They are. But the larger floor standing ones are more versatile. Floor standing models are also heavier (on the order of hundreds of pounds) than benchtop models. This is both good and bad depending on what you’re looking for. Due to being heavier, the floor standing band saws are much more stable. But they are also a bearcat to move any notable distance. Benchtop band saws are lighter and smaller. So, they are easier to move and take up less space. But you’ll sacrifice power, throat capacity, and height capacity. Floor-model 14-in. band saws feature heavy construction. They have vibration-dampening cast-iron components, induction motors, and substantial blade guides. Plus tensioning and tracking systems and a full range of blade choices. 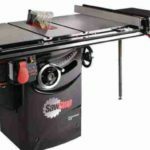 They have larger cutting capacities than benchtop saws and larger tables. Is the combination of capability and stability these saws offer worth the cost? If you’re an avid woodworker, yes, especially if you want to try your hand at resawing. Band Saw Blade & Accessories. There aren’t many accessories to look for in bandsaw boxes. Blades are common but should be checked before use as they usually aren’t top of the line. Determine what type of blade you need to ensure you find the right fit. A good blade improves your accuracy, and so will two popular accessories in the miter gauge and rip fence. The latter end is commonly found in bandsaw boxes while gauges are a bit rarer in the budget class. The best band saw is the one that serves your specific needs. Reading this guide should’ve bought you more clarity and information that you can use. Consider all the factors and shortlist ones that you think are most useful. Examine each product against your requirement and working conditions. This will help you identify the best band saw. Below are a few frequently asked questions that you may want to see so you can begin shortlisting products. 1. What type of work will you be using the saw for? The nature of your work will determine the answer to this question. Do you need a bandsaw to do on-site work? Or do you need it for your workshop? Also, think about what material will you be working with. 2. What size of wood or metal will you be using this on? Every band has a certain capacity. You need to be clear about the size of the material you will be working with. Be it wood, metal or plastic. Knowing the size will help as a reference point to finding the right band saw. 3. How often will you be using your band saw? A hobbyist usage of a band saw will differ from a professional. To find out what could be the least and most usage you need that will serve your need. 4. Will you get enough use out of it? It’s smart to make the most use of the features of the band saw. When making a purchasing decision understand the capabilities of the band saw. This way you’d know whether buying it would be worth it or not. 5. What size do you need? The size of the band saw is again directly related to your requirements. Once you are clear of this you’d know what size band saw will be most beneficial for you. 6. Should you get a band saw or a scroll saw? 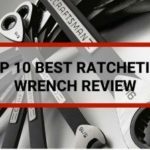 These two are some of the most important tools that you can have in your workshop. With a band saw, you can deliver the best outside cuts for a unique set of patterns. However, it is impossible to get the best isolated interior cuts with a band saw. That is where scroll saws come in handy. A scroll saw can produce the best interior cuts. However, there are times when your success is limited to curves with a specific radius. Especially wider minimum ones. Scroll saws are capable of piercing cuts, meaning an internal cut, made in a piece, with no entry or exit cut. This can be done by drilling a hole in your material and threading the scroll saw blade through it. This cannot be done on a band saw. 7. Should you get a band saw or a Jigsaw? The jigsaw is a handheld power saw that uses a reciprocating blade to make cuts. The biggest strengths of the jigsaw are its high level of convenience. Plus its ability to cut curves on a variety of materials. Both tools cut curves in wood, but are not interchangeable. The jigsaw is ideal for narrow, precise and complex cutting power tool. Instead, the resawing can be achieved with manual or even a table saw tools. But the accuracy of the band saw achieves a very good final product as it relates to resawing. The jigsaw can make straight cuts and short lengths. But cannot match the ability to pass the entire length of a table through the blade. For it to split the wood pieces thinner as in the case of the band saw. 8. What production level do you need? Simple manual controls up to CNC versions. Band saws today are available today for various purposes. Also, consider options such as ease of maintenance and availability of parts.